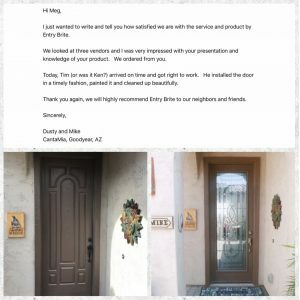 I just wanted to write and tell you how satisfied we are with the service and product by Entry Brite. We looked at three vendors and I was very impressed with your presentation and knowledge of your product. We ordered from you. Today, Tim arrived on time and got right to work. He installed the door in a timely fashion, painted it and cleaned up beautifully. Thank you again, we will highly recommend Entry Brite to our neighbors and friends.